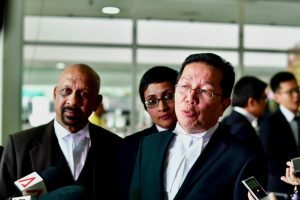 SHAH ALAM — More than a month into the murder trial in one of the most brazen, cunning and perplexing assassinations seen in a long time, defence lawyer Gooi Soon Seng was on the front foot. “When was the first time you identified them, when was the first time you saw the CCTV footage?” Seng asked Wan Azirul, a police investigator and prosecution witness. The lawyer was referring to 4 North Korean men seen on footage from Kuala Lumpur International Airport on February 13 this year. That morning, Kim Jong Nam, the estranged half brother of the North Korean dictator Kim Jong Un was poisoned with VX, a chemical weapon, while waiting at the airport to board a flight to Macau. The grainy security camera videos could be key to the case against the only two people standing trial in the case, which is being tried In a small courtroom about 20 miles from the centre of Kuala Lumpur. 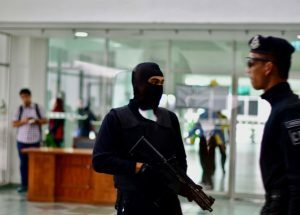 SHAH ALAM — The two defendants appeared in court with scarves wrapped around their heads, partially obscuring their faces. One of the young women spoke animatedly, hands awhirl as she bantered with her lawyers during a recess. Her relaxed demeanor belied the charges against them. Since Oct. 2, Siti Aisyah, a 26-year-old Indonesian, and Doan Thi Huong, a 29-year-old Vietnamese, have been on trial in a Malaysian courtroom for what prosecutors consider a brazen assassination. The court has seen the closed-circuit camera footage from Feb. 13 at the airport in Malaysia’s capital, Kuala Lumpur — aired on TV worldwide — that shows the two women sidling up to a portly, middle-aged man and appearing to rub their hands in his face. The man, who turned out to be 46-year-old Kim Jong Nam, the estranged half brother of North Korean leader Kim Jong Un, died shortly afterward from what an autopsy concluded was exposure to the lethal nerve agent VX. JAKARTA — As concerns grow about rising obesity in Southeast Asia, Indonesia will introduce legislation next year aimed at reducing the content of sugar, salt and fat in food. 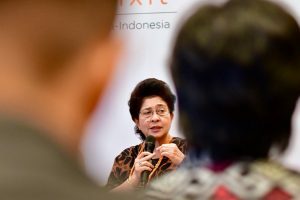 “We want to push our industry to make it low sugar, low salt, low fat,” Nina Moeloek, Indonesia’s health minister, told the Nikkei Asian Review. “Next year the Ministry of Industry will make regulations for sugar, salt and fat,” she added. In August Singapore Prime Minister Lee Hsien Loong railed against sugar-laden drinks in a televized speech. Lee’s tirade prompted seven beverage makers, including Coca-Cola, to commit to “a maximum sugar content of 12% for all of their drinks sold in Singapore by 2020,” according to the health ministry of Singapore, where an estimated one in nine people are diabetic. Sugar taxes are also being considered in Singapore and will be implemented in Western countries such as France, Ireland and possibly the U.K.
KUALA LUMPUR — Businesses in Southeast Asia are increasingly counting the cost of land grabs, more than half of which result in delayed projects and nearly three-quarters of which lead to lawsuits, according to a wide-ranging research report. Out of a sample of 51 major land disputes surveyed across the region, all but 6 remain unresolved, meaning that Southeast Asia is the region most prone to land conflict in the world. 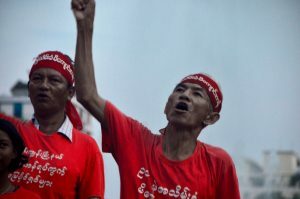 That is according to research published Tuesday by UK-based consultancy TMP Systems and the Rights and Resources Initiative, a global coalition of land rights activists funded in part by the British and Norwegian governments. That 88% of land disputes in Southeast Asia are not resolved puts the region above the 61% global average, according to the research, which covers land disputes dating from 2001. 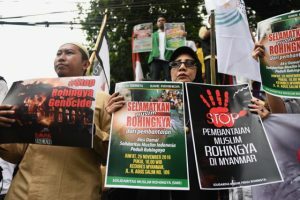 JAKARTA — Hundreds of protesters in Indonesia rallied for the third straight day Monday as Muslim nations across Asia voiced growing concern over Myanmar’s brutal military crackdown against its Rohingya Muslim minority . 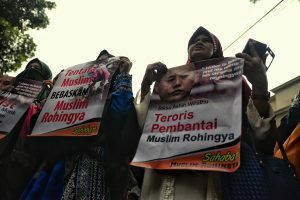 Gathering outside the Myanmar Embassy in Jakarta, the demonstrators, mostly hijab-clad women, chanted, “God is great!” and demanded the Indonesian government put pressure on neighboring Myanmar to stop the military operation that has sent tens of thousands of Rohingya refugees streaming into camps in Bangladesh — the second such exodus in the last 12 months. “We are here because of solidarity of Muslims,” said one demonstrator who gave her name as Mama Bahin. 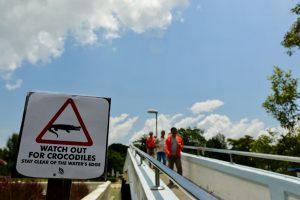 JAKARTA — Officials in the eastern Malaysian Sarawak region are hoping that grim tales of limp fishermen’s corpses wedged between the jaws of giant crocodiles will soon be no more after granting 45 licences to hunters on Friday.“Those who have obtained their licences from us can start harvesting crocodiles in the wild,” said Engkamat Lading, a local forestry department official. Most of the permits will only allow hunters to sell crocodile meat locally, with three applicants for licences to export meat, skin or hatchlings under international rules governed by the Conventional on International Trade in Endangered Species of Wild Flora and Fauna, or CITES, according to the Borneo Post, a local newspaper that carried the official announcement. JAKARTA — Official crackdowns on emigrants in Malaysia and Thailand have cast further doubt on over prospects that member countries of the Association of Southeast Asian Nations can finalize a long discussed deal on migrant workers’ rights. In June and July around 100,000 mostly Myanmar migrant workers fled Thailand after the military government in Bangkok announced hefty new fines for undocumented workers and their employers. Then, starting July 1, Malaysia made a series of arrests of alleged undocumented migrant workers, affecting more than 3,000 workers and around 60 employers accused of giving work to illegals. These tough actions — though a reprise of previous years’ crackdowns — come as the region’s governments mull proposed enhancements to the 2007 ASEAN Declaration on the Protection and Promotion of the Rights of Migrant Workers, signed in Cebu in the central Philippines during one of Manila’s past tenures as the group’s chair. Two years after the Cebu declaration, ASEAN countries started moves toward a set of region-wide legal norms, but progress has been slow. With Manila again chairing ASEAN this year, there has been a renewed push to address migrant rights — an important social and political issue in the Philippines. JAKARTA — Indonesia and Malaysia, which produce more than 80% of the world’s palm oil, are resisting proposals by European parliamentarians that could limit their access to the second biggest palm oil market after India. Government ministers from Malaysia and Indonesia, along with some regional palm oil producers, met in Jakarta on April 11 to plan a response to a resolution approved on April 4 by European parliament members concerning “palm oil and deforestation.” The parliamentarians requested the EU to “introduce a single certification scheme for palm oil entering the EU market and phase out the use of vegetable oils that drive deforestation by 2020.” They hope for an EU-wide ban on biodiesel made from palm oil by 2020, claiming that the expansion of palm oil plantations, mostly in Southeast Asia, is causing “massive forest fires, the drying up of rivers, soil erosion, peatland drainage, the pollution of waterways and overall loss of biodiversity.” Indonesia’s Environment and Forestry Minister Siti Nurbaya Bakar called the EU proposals an “insult,” while the foreign ministry accused the EU of “protectionism” and of ignoring the rights of millions of Indonesian farmers whose main source of income is from small oil palm plots. JAKARTA — Malaysia’s environment minister is sure that 2017 will not see a repeat of the choking, eye-watering smog that covered parts of his country, as well as Singapore and areas in Indonesia, for around two months in 2015. “We are very likely to be haze-free this year. 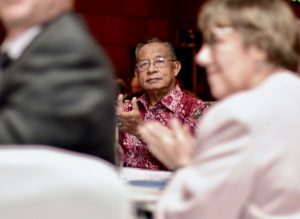 Even if it comes, it will not be as serious as before,” said Wan Junaidi Tuanku Jaafar, Minister for Natural Resources and Environment, on March 2. Mostly caused by the burning of peatland and forests to clear land for plantations in Indonesia, Southeast Asia’s haze has for three decades been a near-annual blight that makes air in Kuala Lumpur and Singapore, two of Asia’s most dynamic cities, almost unbreathable and in turn, diminishes economic output. Prolonged bouts of the haze, such as in 1997 and in 2015, caused diplomatic ructions as Singapore railed against neighboring Indonesia over the impact of the pollution on its citizens and their livelihoods. But a new Indonesian government-backed alliance of farmers, businesses, environmentalists and concerned citizens aims to prevent more debilitating blazes in southern Kalimantan and western Sumatra, home to much of Indonesia’s lucrative palm oil and pulpwood sectors. 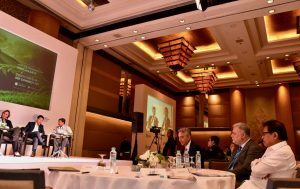 “The Indonesian government is very serious on tackling the forest fires,” said Prabianto Wibowo, assistant deputy minister for forestry at Indonesia’s economic co-ordination ministry, speaking at the Responsible Business Forum in Jakarta on March 15.